Known for novels featuring "great pacing and true surprises" (Kirkus Reviews, starred review) and "nerve-shattering suspense" (Heather Gudenkauf, New York Time bestselling author), New York Times bestselling author Kate Moretti's latest is the story of a scandal-torn Pennsylvania town and the aftermath of a troubled girl gone missing. Until, of course, more important question arose, at which time everyone promptly forgot that a thousand birds fell on the town of Mount Oanoke at all." Beloved baseball coach and teacher Nate Winters and his wife, Alecia, are well respected throughout town. That is, until one of the many reporters investigating the bizarre bird phenomenon catches Nate embracing a wayward student, Lucia Hamm, in front of a sleazy motel. Lucia soon buoys the scandal by claiming that she and Nate are engaged in an affair, throwing the town into an uproar...and leaving Alecia to wonder if her husband has a second life. Nate's coworker and sole supporter, Bridget Harris, Lucia's creative writing teacher, is determined to prove his innocence. She has Lucia's class journal, and while some of the entries appear particularly damning to Nate's case, others just don't add up. Bridget knows the key to Nate's exoneration and the truth of Lucia's disappearance lie within the walls of the school and in the pages of that journal. 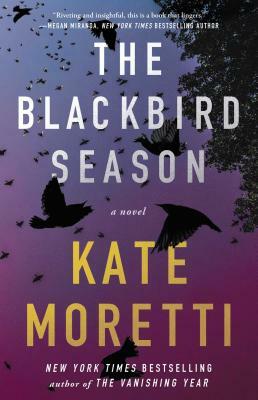 Told from the alternating points of view of Alecia, Nate, Lucia, and Bridget, The Blackbird Season is a haunting, psychologically nuanced suspense, filled with Kate Moretti's signature "chillingly satisfying" (Publishers Weekly) twists and turns.